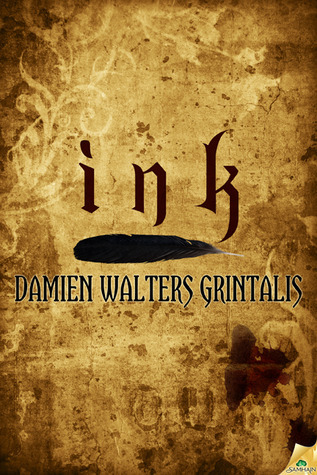 Ink is the first published novel of Damien Walters Grintalis. In the past year or so I’ve enjoyed a number of beautiful short stories by Grintalis, most characterized by an especially lush and vivid quality to the language. Though I’m often reluctant to take a chance on first novels, as they’re so often flawed in terms of structure and pacing, her short fiction convinced me Ink would be worth a try. It’s the story of Jason Harford, a young man devastated after having been left by his wife just before the novel begins. He sets out to soothe the pain of rejection, telling himself he’s celebrating his newfound autonomy by doing things his controlling ex-wife never would’ve permitted. He gets drunk in a bar, and acquiesces to a stranger’s suggestion that he should get a tattoo. The tattoo artist, a crusty and uncomfortably menacing old guy Jason calls “Sailor,” asks Jason to sign a liability waiver before he proceeds. Jason starts to wonder what he’s gotten himself into, but the resulting tattoo of a griffin is beautiful, exactly what he wants. It impresses his friends, even leads to a hookup with an attractive young lady named Mitch, who also happens to have a griffin tattoo. Jason starts to think he’s dodged the worst of the pain of being rejected by his wife. A cool new tattoo, more time to spend with his friends, even a cute young lady who fell into his lap, and seems really into him. Maybe things will turn out better for Jason, not worse… right? Many writers whose short fiction is especially poetic or stylized often take a simpler approach when working at novel length, and that’s the case here. The writing is deft and effective, with a straight-ahead style of minimal adornment, a focus on clarity. There’s never any question what’s happening, or why a character is doing what they are — both frequent problems in first novels. The story is engaging from chapter one, and moves briskly through to the end without faltering or getting side-tracked. Grintalis is certainly an emerging writer worth keeping an eye on. I’d love to see her approach the novel form using the more poetic, almost ornamented style of language of some of her short stories. In any case, Ink is a successful and most promising debut novel.